Why Should I be Concerned about Author Rights? Publishers may discourage or even create significant barriers for authors who want to reuse their own work, or share it with others; meanwhile, granting agencies such as CIHR and SSHRC increasingly require that work funded by them be made available openly. Negotiating changes to standard publishing agreements can help authors to avoid or mitigate barriers to reuse and sharing, while facilitating both accountability requirements and the open sharing of scholarship that authors want to do. Before signing, strikeout and/or modify language in the publishing contract, replacing your grant of "exclusive" rights to the publisher to granting "non-exclusive" rights to the publisher. Initial your changes and submit a signed copy to the publisher. In many cases, publishers will accept such changed contracts. 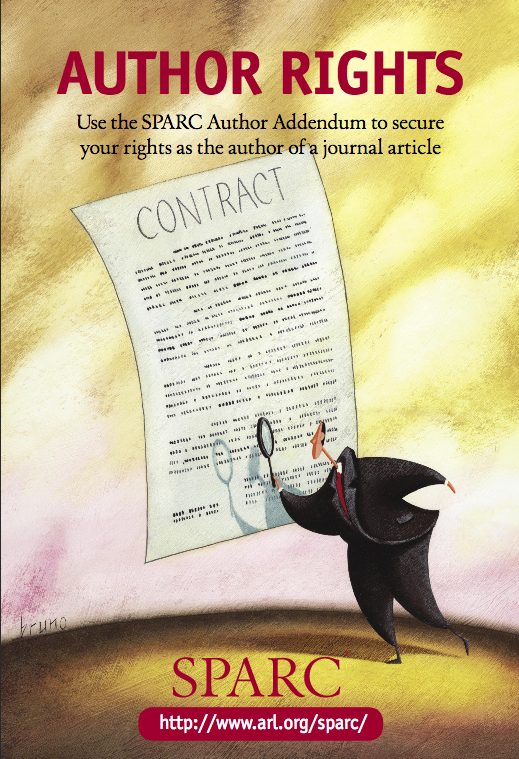 Option Two: Submit your contract together with the SPARC Author Addendum, or another addendum that meets your requirements. An addendum allows you to grant additional rights to the public, such as use of the work for non-commercial purposes provided attribution is given. This approach may foster use and extend the impact of your work. Option Three: Creative Commons licenses allow you to communicate clearly what you intend with respect to use of your published work. * adapted from University of Iowa Libraries' Author Rights guide. Retrieved 2015 May 12. When choosing where to submit your work for publication, one important consideration should be what rights you retain as author, or may be able to negotiate in the publishing contract. Prioritizing your author rights is important because this determines your flexibility to decide how and where students, colleagues and the public may access your work — including on your own website, in D2L or other learning management systems, or through the Library's institutional repository, VIUSpace. SHERPA/ROMeO offers a database of author rights, searchable by journal title or publisher, that summarizes the rights that each offers and provides links to publisher websites for specific conditions, including statements that should be included with self-archived pre- or post-prints. Keep in mind that it may be possible to negotiate additional rights to those described in the database or offered in a contract. Tri-Agency Open Access Policy on Publications FAQ: How do I retain copyright of my research paper? "The law allows you to transfer copyright while holding back rights for yourself and others. This is the compromise that the SPARC Canadian Author Addendum helps you to achieve." "...identifies clauses that frequently appear in publishing contracts, explains in plain language what these terms (and typical variations) mean, and presents strategies for negotiating “author-friendly” versions of these clauses. When authors have more information about copyright and publication options for their works, they are better able to make and keep their works available in the ways they want." White | archiving not formally supported..."